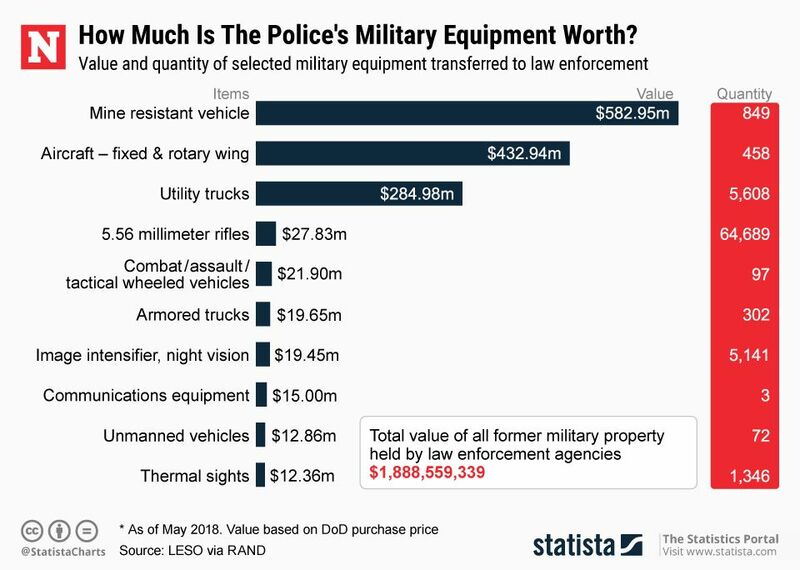 A recent report in Newsweek showed that law enforcement agencies have acquired six billion dollars of military surplus equipment over the past 18 years. The article, titled “Militarization of Police,” points out the majority of products fall in the “uncontrolled” category. The article also states that some police agencies have been expelled from the program. Not long ago I bought an Army surplus folding shovel, a sleeping bag and a mosquito net. I suppose Newsweek would call that the militarization of my camping gear. Surplus items are useable assets that supplement the mission of local law enforcement. Most police agencies are small, and all police agencies are on a limited budget. Large departments with many members often have huge call volumes that tax their resources, and many have vast geographical areas to cover. In addition, large agencies are the de-facto emergency backup for smaller agencies that are nearby. In remote areas, what may seem like exotic equipment – such as armored vehicles – needs to be locally available since waiting for the arrival from another department may be too late to be of value in a rescue. Two categories of military surplus are available to police agencies. Uncontrolled items are those of small monetary value with limited useful life. Controlled items are those that require a high degree of accountability like vehicles and weapons. When a report states that most items provided to law enforcement are uncontrolled it simply means that no federal accountant is asking what happened to that box of adding machine paper. A chart accompanying the Newsweek article lists assault vehicles along with mine resistant vehicles and armored trucks. While that terminology certainly implies a military mission, the way these vehicles are used by civilian policing is anything but war-like. Patrol vehicles are efficient for carrying a minimum amount of equipment and getting one or two officers from one place to another efficiently. But when there is flooding, blizzards, or gunfire, that squad car is of little value. Vehicles from military surplus with armored skins are critical for inserting rescue crews into areas where the threat of gunfire precludes sending officers in on foot or conventional patrol cars. And for those who snicker at small towns having armored vehicles, there’s no shortage of testimony to their need and value. To the question of, “Why do you need a mine resistant vehicle?” the answer is, “We don’t.” But getting what departments really want – a personalized, civilian, all-purpose tactical vehicle – is beyond the budget of most agencies. So for the price of transportation, departments get what they can in the form of something originally purposed for combat, but usable for rescue and high-risk operations. Other types of vehicles can be equipped with special operations items that would not be efficiently accommodated in a typical patrol vehicle. A persistent myth is that all the big items like aircraft and armored vehicles come with machine guns and rocket launchers. While the 5.56 rifle is a frequently obtained item, the value of an actual automatic weapon in a civilian policing scenario is limited. Of the 458 aircraft provided through the surplus program, there were none with mounted .50 cal door gunner weaponry included. The same is true for surplus vehicles of any sort. If the criticism of the surplus program rises again, department representatives need to be ready with the facts and realities to assure their citizens that the equipment is useful, peaceful and a taxpayer’s bargain.